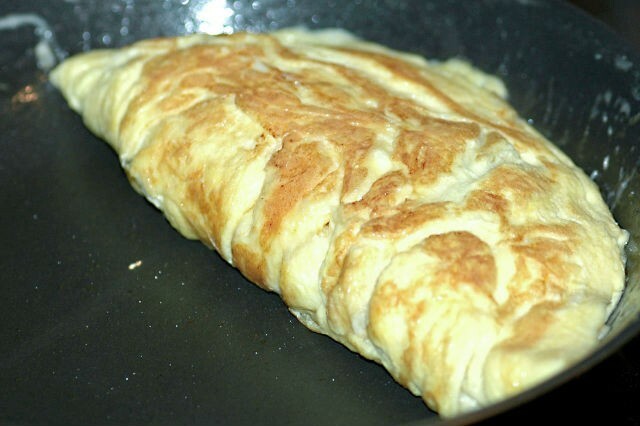 A classic breakfast (or evening snack) dish, this cheese omelet is simple to make. It is also one of the quickest and healthy breakfast that any one can make. Serve with toast and orange juice to complete the meal. 1. Break the eggs into a bowl. 2. Add water, salt and pepper powder. 3. Beat with a fork without making it fluffy. 4. Heat 1/2 tsp butter in a non-stick pan over medium flame. 5. Pour 1/2 ladle of the egg mixture and cook for 30 seconds. 6. Carefully push the egg from side to side to evenly cook the egg. 7. Cook until the omelette is almost set but still creamy and moist. 8. Sprinkle 2 to 3 tblsp of the cheese. 9. Fold the omelette in half and cook for another 10 seconds. 10. Gently remove to a serving plate. 11. Garnish with spring onions. Feel free to comment or share your thoughts on this Cheese Omelette Recipe from Awesome Cuisine.